A couple of years ago I heard Alastair McIntosh speak about his new book, Hell and High Water: Climate Change, Hope and the Human Condition. He was one of the most compelling speakers I’d heard in a long time, and I bought all his books at the end of the talk – except the one in question, which for some reason hadn’t been delivered to the Greenbelt Festival. So here I am reading it now, finally getting round to it. And what a beautifully odd and human book it is. It begins with a summary of climate science, the effects, the consequences, with a particular focus on Scotland. The book then goes on to review some of the solutions. Ultimately, McIntosh concludes that in a competitive, capitalist, consumer society, there is a fundamental disconnect between what we know we need to do to stop climate change, and our willingness to do it. Our politics and our culture are simply not up to the task of crossing the “vast chasm” between our over-consuming selves and a sustainable lifestyle. Climate change thus serves as a warm up act to look much deeper at the human condition. “The central thesis of this book is that climate change cannot be tackled by technical, economic and political measures alone. Those things are important, but in addition and perhaps most important of all, we have to look at ourselves.” In this second part of the book McIntosh leaves the science to one side, and plunges into mythology, history, literature, seeking an explanation for our self-destructive streak. He explores the story of the tower of Babel, Socrates, MacBeth, identifying hubris as the source of violence against ourselves and against the earth. It’s richly literate. One passage references the Epic of Gilgamesh, the Lord of the Rings, Richard Dawkins, Joseph Conrad and the book of Job all in a single paragraph. It suggests an author with an active imagination, easily captivated by phrases and metaphors, someone who makes sense of things through imagery and is not afraid to talk in poetic terms himself. I can understand how more literal readers would find this rather frustrating. I think it’s wonderful. In answer to this spiritual problem, consumer cultures need to change and undergo what McIntosh calls “cultural psychotherapy”. 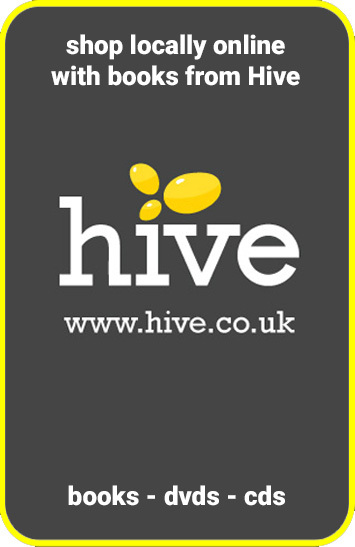 He proposes a 12 step programme for facing our addictions as individuals and as a society. It includes more holisitic education, non-violent security, a cooperative rather than competitive ethic, an economy geared towards meeting needs, and a willingness for each of us to open up to our fundamentally spiritual natures. 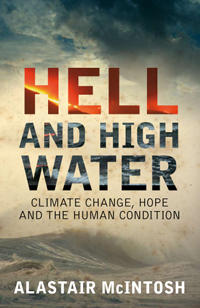 Hell and High Water communicates a simple and vital truth: that climate change is “cultural, psychological and spiritual.” It does so in a poetic, chaotic manner, rambling through ancient history, literature, spiritual traditions, psychology and ecology. It is wise, wry, sad, esoteric, and in the author’s words “unfinished and unfinishable”. It’s not for everyone, but for those with an open mind and a willingness to take the scenic route, it’s a unique and profound journey. Thanks for this review, which summed up my own experience of a creative, insightful, unorthodox and deeply moving book. Next Entry Can we save Abbotswood Park?